Khenpo Kunga Wangchuk (Tib. མཁན་པོ་ཀུན་དགའ་དབང་ཕྱུག, Wyl. 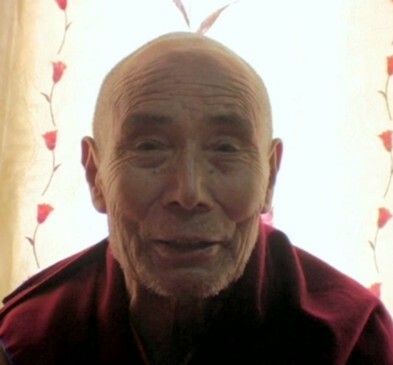 mkhan po kun dga' dbang phyug) (1921-2008) was the seniormost khenpo at the Dzongsar Institute in India. Khenpo Ngawang Kunga Wangchuk was born in 1921 in the state of Derge in East Tibet, in the Jonda district, in the village of Renda. At the age of twelve his parents taught him to read and write. He worked on his parents' farm until the age of eighteen. In 1938 he took monastic ordination at Dosib Monastery, which belonged to the Ngor lineage of the Sakya school. His uncle, Khenchen Dosib Thubten Gyaltsen, was the head of the Monastery. From Dosib Khenpo Dzepa Lekshe he received the precepts of an ordained monk. When Khenchen Dosib Thubten Gyaltsen founded a shedra at the Monastery, Kunga Wangchuk was able to join the teachings. In 1939 Kunga Wangchuk went on a one-year pilgrimage to Lhasa and Central Tibet. At Ngor Monastery he received the precepts of full monastic ordination from Ngor Khenchen Jampa Namkha Kunzang Tenpe Gyaltsen, and received the name Kunga Wangchuk. Returning first to Kham, at the age of twenty-two, he joined the shedra at Öntö Monastery in order to study with Öntö Khyenrab Chökyi Özer. In 1943, Jamyang Khyentse Chökyi Lodrö requested Khenchen Dosib Thubten Gyaltsen to teach as the main khenpo at Dzongsar Shedra. Kunga Wangchuk accompanied his uncle as his attendant. This was the first time Kunga Wangchuk met Jaymang Khyentse Chökyi Lodro. He went on to receive many teachings from him, including a commentary on Shantideva’s Compendium of Training. Khenchen Dosib Thubten Gyaltsen taught for eight years at Dzongsar Shedra and Kunga Wangchuk was able to join the teachings for the entire period. During this time, Kunga Wangchuk became his uncle's assistant teacher. He later said that the pressure to prepare for the teaching sessions was so great that he had to study for most of the night and hardly found time to sleep. Later, Kunga Wangchuk received many teachings on sutra and tantra from Dezhung Tulku Ajam Rinpoche, and Yena Chöphel Rabgye. In total, Kunga Wangchuk studied for over ten years with Dzongsar Khyentse Chökyi Lodro and his uncle Khenchen Dosib Thubten Gyaltsen. At the age of thirty-one, in 1951, Kunga Wangchuk returned to Dosib Monastery and became the main khenpo there, teaching about twenty students. In 1956, he started a shedra at Vara Monastery in Derge with twenty students. He taught there until 1959, when the Chinese invasion of Tibet made it impossible to teach any longer. He was imprisoned by the Chinese from 1962 until 1980. After his release, he stayed with relatives in Derge for one year. During this time, he received three letters from Dzongsar Khyentse Rinpoche inviting him to India. After a long seven-month journey, Khenchen Kunga Wangchuk finally arrived in Sikkim at the age of 62. Following an extensive pilgrimage in Nepal and India, he started the new Dzongsar Shedra in 1983 in West Sikkim, at the holy site of Dechen Ling. In the beginning, the shedra only had seven students, one of whom was Dzongsar Khyentse Rinpoche himself. In 1985 the Dzongsar Shedra moved from Sikkim to Bir in North India. Over 70 monks joined the new shedra, and by 2003 the number of students had grown to 450. Khenchen Kunga Wangchuk himself taught until he reached the age of 73. He always taught the thirteen great texts based on Khenpo Shenga’s commentaries, and he himself composed further commentaries to several of Khenpo Shenga's texts. In 1997, during a visit to Taiwan, he composed a commentary on the ninth chapter of the Bodhicharyavatara. Through his great efforts, Dzongsar Institute renewed its reputation as one of the foremost centres of Buddhist learning. In 2004, it was relocated to Chauntra and renamed the Dzongsar Khyentse Chökyi Lodrö Institute. His Holiness the Dalai Lama presided over the three-day inauguration.